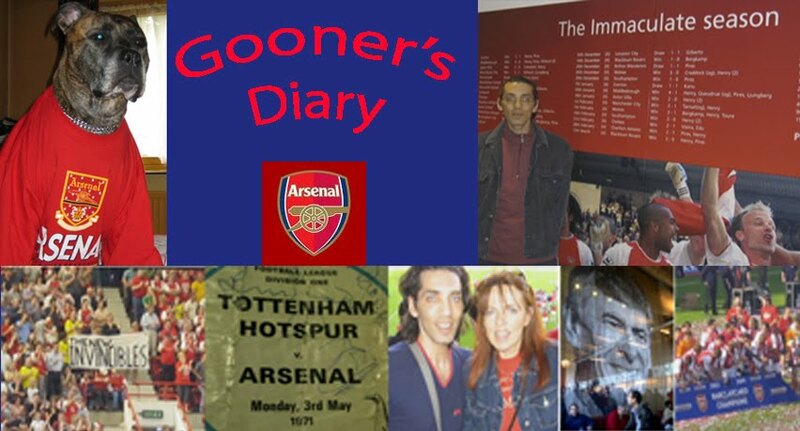 Gooner's Diary: Ooh To, Ooh To Be, Ooh To Be A Gooner! Ooh To, Ooh To Be, Ooh To Be A Gooner! I received a comment on my blog from someone who said that my posts are so long that they've never yet managed to finish one on them. So for the benefit of Sourena, I will try to keep this preamble short & sweet (yeh and some of those porkers from Jimmy's Farm have just passed their pilot's license :-). Although to be honest, considering how I've prattled on in previous months when we've been playing so pony, with my verbal diahorrea, it's hard not to wax lyrical when we're conjuring up some of the most sublime footie we've seen all season! I watched Spurs play WBA last week and it occured to me afterwards that the Lillywhites efforts were so unimpressive that if we can't finish above Spurs then we really don't deserve Champions League footie. Then again most of those poor fatalistic fools from the wrong end of Seven Sisters Road that I've spoken to, they all seem to think they've long since blown any chance they might've had of finishing above us. If you compare the sensational footie seen at THOF on Saturday to the performances of any of the teams supposedly challenging us for that priceless fourth place (albeit that Blackburn have yet to play), based on current form (and the assumption we can maintain it), then surely it's a foregone conclusion? It was like slipping back into a favourite pair of ones most comfortable shoes on Saturday, as the easy air with which we went about slaughtering Villa with such simplistic grace, came as reassuring confirmation that results against the Fulham, Scousers and Charlton weren't just positive blips like the one against Boro, in a season beset with abysmal inconsistency. I don't want to speak to soon but our makeshift back four is looking anything but makeshift and suddenly we look every bit as capable of the sort of astonishing feats of a couple of seasons back, with the added bonus of the variation of Van Persie and Adebayor up front and the energy levels and enthusiasm of a squad with a far younger average age. I heard one of the pundits on the box bemoaning the possibly loss of Cesc and Manny in Turin because apparently our squad doesn't really have the depth to cope with injuries to key personel. Personally I'd love to retain the current back line and believe it would be wrong if the likes of Campbell and Cole were automatically returned to the first team, since it would be very harsh on Flamini, Eboué, Senderos or Kolo if they were dropped and those returning from fitness need to bide their time on the bench and battle to earn a place back in the starting line-up. However although I've highlighted below my concerns about the knocks our two young starlets picked up on Saturday , for me personally, the evidence that this team is really on fire, comes by way of the same feeling we had when the Invincibles were at their peak, in as much as you get this sense that the enite squad is interchangeable and to a large extent, no matter who drops out injured, or who comes in to replace them, the confidence levels remain the same. We saw this on Saturday, with the absolutely seamless substitution of Diaby for Fabregas and to a lesser extent when Johan Djourou replaced Manny Eboué. While as a centre back by trade, the Swiss youngster might not offer nearly so much in attack, there was never any feeling of vulnerability down our right flank. I pray that the alarm will have permeated my consciousness and prised me from my pit, so that by the time this diary piece appears in the Irish Examiner, I'ill be winging my way to Turin. I’ll have no one to blame but myself, if I should oversleep and miss my crack of dawn departure. However if the Arsenal somehow end up shooting themselves in the foot in the Stadio Delle Alpi, personally I’ll be pointing an accusatory finger at Oisin Langan. My brief chat with the Newstalk106 radio host was pre-recorded; otherwise I might’ve pulled him up on Sunday afternoon, for the flippant way in which he tempted fate by “absolutely guaranteeing” that the Gunners would go through. Undoubtedly the Italian media will’ve already written off their domestic champions’ European chances. So we definitely don’t want to be gifting their manager with any more motivational tools, such as Oisin’s cavalier counting of our semi-final chickens, with which Capello could inspire a miraculous comeback. I’m led to believe that the fact that European matches aren’t included in the Italian’s season tickets is one of the principal reasons for poor attendances. They often get an embarrassing turnout at the enormous Stadio Delle Alpi and with a 2 goal deficit, there’s likely to be even less locals there than usual. Thus my greatest concern is that the Gunners might be lulled into a false sense of security, when they witness the vast expanses of empty concrete terracing in this cavernous arena. They might think they’ve already done all the hard work and I’m wondering whether they’re going to struggle to fire themselves up in front of such a feeble audience. Juve’s stadium was absolutely deserted for our last anti-climactic encounter in 2002. I was amongst the thousands of Gooners who’d made plans to travel to Turin in advance, assuming the last group game between us would be a glamorous, high-octane affair. It turned out to be the exact opposite. Bottom of the group, Juve were already out of the competition and sent out a reserve team. While we had a feint chance of qualifying, if Depor could do us a favour against Bayer Leverkusen. But the Spanish side also sent out a second string, as they’d already qualified for the quarterfinals. In a match devoid of any atmosphere, I spent much of the 90 trying to translate the score coming from the Riazor on my radio, since it didn’t really matter what went on in front of us unless Leverkusen lost. I recall a bit of a buzz, when we heard that Depor had brought on the big guns after going 2 goals down. But any glimmer of hope when Tristan got one back, was soon snuffed out when Zalayeta, a complete unknown sub for Juve, scored the only goal of an entirely miserable game. We had a much happier trip to Northern Italy for the 2nd leg of the Cup Winners Cup quarterfinal in 1994 against Torino, when we took a typical ‘1-0 to the Arsenal’ to Turin . The stadium was still half-empty, but at least the city’s second team attracted a relatively respectable sized audience. I’ve got some fabulous photos of the fusillade of flares which the Torino fans ignited on the terrace behind one goal and if I remember correctly with the resulting cloud of smoke, it was 10 minutes into the match before it subsided sufficiently to be able to the pitch clearly. I’d bite your hand off for a repeat of the 0-0 shut out we achieved that night to reach the semi-final of this now defunct competition. However Wenger’s sides just aren’t designed to sit back and grind out a clean sheet. Obviously there’s likely to be a natural tendency for the Gunners not to be too ambitious, but it’s going to be a very long night if we sit back and try to soak up pressure for the entire 90 minutes, while Juve regain their confidence. Really I’d like to see us capitalize on the respect we earned in the 1st leg and go for their throats, but in truth this just ain’t gonna happen. Hopefully the 2 goal deficit will mean that Juve can’t afford to play their customary waiting game, patiently expecting to pinch a goal at some stage. As the clock ticks away and they grow increasingly desperate to get on the scoresheet, they should leave themselves increasingly exposed to being hit on the counter-attack, especially with all our pace out on the expanses of their wide pitch. My feeling is that if we can make it past the 20 minute mark without conceding the goal that would undoubtedly raise the home team’s hopes and their spirits, Juve’s task could appear increasingly impossible and perhaps their heads will begin to drop. Yet unlike Oisin, as the eternal pessimist and with the likely return of the mercurial talents of Nedved and Del Piero (while we face doubts over the fitness of Fabregas and Eboué) as far as I am concerned nothing is guaranteed until we nail home the lid on the Old Lady’s coffin with that crucial away goal. The closer we get to an elusive European crown, the more I begin to wonder whether our name might be on the trophy. But by daring to believe, the more disappointed I’d be if we were to fall at the last couple of fences. In truth I want the one missing trophy from the Arsenal’s illustrious list of honours, so the rest of the footballing world can acknowledge, what every Gooner already knows to be true, that Arsène Wenger walks on water. When you consider the sort of pragmatic, conservative tactics necessary to achieve Champions League success in recent times, it would be wonderful if Wenger could prove capable of scaling such heights with his purist form of footballing entertainment. Additionally there’d be more than a little satisfaction to seeing a huge shadow cast over Chelsea’s domestic glory for a second successive season. Yet while I wouldn’t admit it to Trizia, it’s league success that’s the litmus test of the consistency necessary of truly great sides. However far football, fate and good fortune (remember FC Thun!) take us in the clash of the Continental titans, Saturday’s slaughter of Aston Villa was further evidence of the halo effect on our Premiership form. Yet perhaps more importantly, with the return of the swagger which comes with beating the likes of Real, suddenly we’ve regained the respect of those opponents who are now afraid to get in our faces, for fear of being made to look foolish and are instead allowing themselves that crucial yard of thinking space that gives us room to play the sort of flair football we’ve been prevented from producing for much of the season. It’s all a matter of perception, as we are once again perceived by our opponents as a force to be reckoned with; instead of a side full of boys who could merely be muscled off the ball. To be honest it’s a huge relief that the good times appear to be back at Highbury with such a vengeance, both in terms of encouraging Henry that he’s hardly likely to have more fun on a football pitch elsewhere and so that we can see the Home of Football off in such fine style. While in one corner of the Clock End on Saturday, the dejected Villa fans were pleading with us “please take O’Leary back”, the Gooner choir behind the goal once again enquired “have you ever seen Chelsea play like this?” The Blues might be umpteen points ahead of us but after watching them limp towards the finish line earlier that same afternoon, I know which of the two teams floats my beautiful game boat.